Ripley figures are apparently like buses — you wait ages for one, and then a bunch come along at once. Now Ellen's daughter Amanda is joining the Ripley figure party as well. Rejoice! For those unfamiliar, Amanda was the protagonist of last year's Alien Isolation, a video game set 15 years after the first Alien movie, where she was ruthlessly hunted down by a lone Alien on a space station. 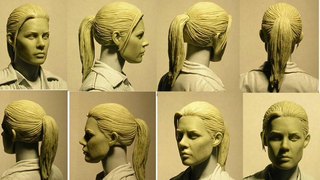 Of course, after all that nightmarish fun, she is being given the high nerd honour of being turned into an action figure as part of NECA's ongoing alien line. NECA teased the 7" figure on Friday so there's not much to go on yet, other than that the figure will be Amanda sans spacesuit as she is on the cover of the game, and instead in the outfit she finds herself in for most of the story. Will she release alongside one of her mother's figures in one of the next few waves? Let's hope so. It's great to see that after years of waiting, there's a veritable cavalcade of Ripley goodness on the way.